They say you should choose a colour that you like rather than fixate on any particular kind of gemstone when it comes to shopping for jewellery because when it comes down to price and availability you might end up being disappointed. I do believe that engagement ring shopping should be approached with the same sort of attitude. It is interesting to see how many new brides-to-be are showing off engagement rings that have been designed to their specific tastes and whimsies rather than opting for the typical diamond ring. Personally, blue stones as a whole are my absolute favourite. They are said to represent jealousy in love (yes, the blue ones – not the green ones) which might sound negative but I reckon you can spin it slightly in your favour and take it to mean that you are protective over the love that is shared between you. Blue gems are also said to represent politeness and vigilance. Not sure how romantic those particular qualities are but at least they are nice qualities. The Ancients believed that sapphires symbolized the heavens and that they empowered the wearer with truth, wisdom and health and were believed to bring the wearer good luck. 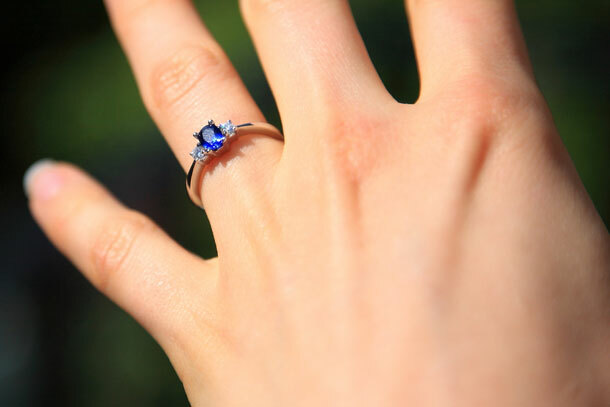 Most importantly sapphires were believed to promote happiness between lovers. Though tanzanite is more commonly available in purple, you do get deep shades of blue tanzanite. There are more valuable stones. Tanzanite is thought to uplift and open the heart. This is an interesting looking stone which is said to represent truth, friendship and wisdom. It is believed that it helps to bring harmony in relationships. A spinel is a particularly beautiful gem and it is said to aid in relaxation and keeping the mind free from worry. The topaz is also believed to be a calming gem. They are said to boost confidence and shield the wearer from depression, worry and insomnia. A symbol of hope, youth and health. In general diamonds are believed to enhance relationships. Blue diamonds symbolize heavenly grace. Nice idea using colour… although I quite like a plain clear diamond… I think I would get fed up of the colour after a while.